Obituary for Harold Mitchell | House of Wheat Funeral Home, Inc.
Mr. Harold Mitchell, age 92, born July 21,1926 in Dayton, Ohio, passed away November 25, 2018 at his home. 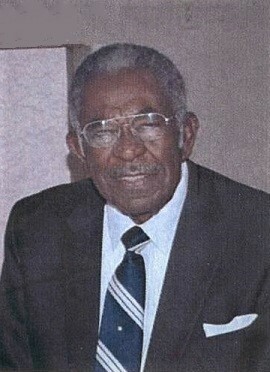 He attended Wogaman Elementary School and Paul Laurence Dunbar High School. Harold was one of the first and youngest known African American store owners in Dayton, achieved through perseverance, calculating and skillful production. With the loving support of his wife, who assured him of her commitment to help him fulfill his aspirations, he succeeded. Working his way up from employee to partnership to ownership. By the age of twenty-four Harold Mitchell's dream came true. Mitchell's Market was known for their freshly ground burgers and friendly neighborhood character. He has always been known for his generosity. Harold had an IOU box in his store which made it possible for those in need to receive groceries and pay later. When Harold had a goal in mind, he showed ambition, determination and motivation, defying all odds to accomplish and surpass his objectives. In his early years he was a track enthusiast, lover of motorcycles, and literally traveled all around the country to all 50 states with his dear wife Jeanette. One of his most fulfilling pastimes was his involvement in amateur radio. In 2011, he received the HAM of the Year OMIK Award. Attesting to his generous nature he also supported charities and was involved in Health and Welfare scholarships working as Fund Director. Preceded in death by his parents, Hammond and Bessie (Mayfield) Mitchell; wife, Jeanette Mitchell; brothers, Leroy Mitchell, Emmitt Mitchell, Earnest Mitchell; sister, Mable Mitchell; son, Timothy Mitchell. Survivors include his dear daughter and son-in-law, Constance Rex and Robert Rex; granddaughters, India Rex and April Gamble; grandson, Erick Rex; grandson-in-law, Tyrique Gamble; great grandsons, Jamin and Isaiah Gamble. Funeral service will be held 11 am Saturday, December 1, 2018 at Corinthian Baptist Church, 700 S. James H. McGee Blvd. Rev. P.E. Henderson, Jr. officiating. Visitation 9 am at the church until time of service. Family will receive friends one hour prior to service. Interment 10 am Monday, December 3, 2018 at Woodland Cemetery. Arrangements entrusted to House of Wheat Funeral Home, Inc.